Dancing is a cool activity for everyone, it is not only fun but also helps to keep fit. Even if you have two left feet, we bet you have thought about learning how to dance at least once. Now it is easier than ever! You may not have time or money for dancing classes but you can find many dance learning apps for any device. You can learn new dance moves, get new ideas to improve your choreography, start practicing dancing for everyday fitness exercises or just have fun. Here are the best apps for learning how to dance we found for you. 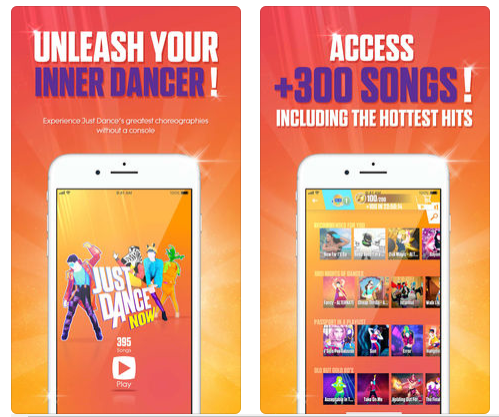 To start with, this is one the most popular dance apps you have probably heard about. It is based on a famous video game for consoles, but now you can have fun just using this app for Android and iOS. Here you can find a large variety of dances and many different songs, and the dance library is updated very often. Repeat after characters who are just the best at dancing and improve your skills. The choreography is very realistic, all the moves are shown as subtitles, so you can dance just right now! This app is good for those who want to have a well-organized video lessons library in their pocket. The videos are made for dancers of different levels and styles, the moves are shown from different angles: everything for effective learning in any place you go. The app is NOT free, however, it provides a 1 week free trial period. This game is very similar to the previous one. 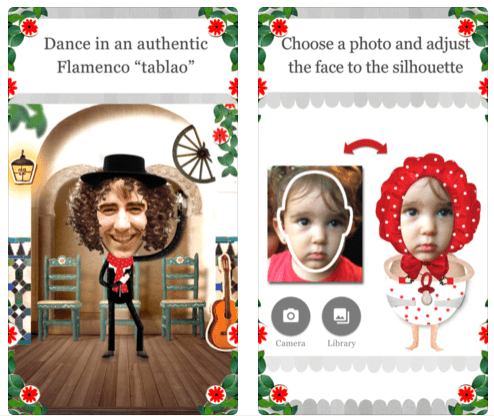 You insert your face and become a crazy flamenco dancer who can show amazing moves everywhere. Try this, you will definitely have fun and enjoy being so skilled at dancing. The app provides many thematic moves as well, so you can use it to enlarge your choreographic experience. With this app, you are guaranteed to have fun. Upload your face and become an elf who is the master of dancing. You can create up to five elves. 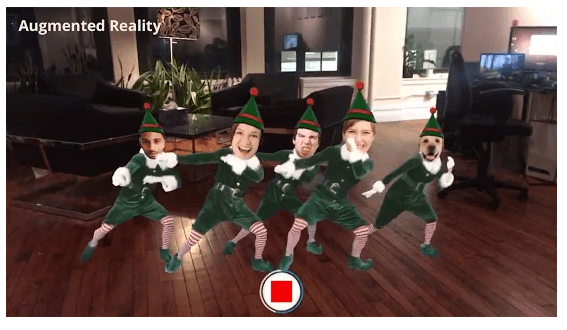 Your elves can dance in any surrounding under your camera, so you can create a personalized video. Many different dances are available. You can learn how to dance too – the elves will show you many moves. But you can just enjoy them dancing as well. And we are going to more serious apps you can learn real dances with. This app is good for those who have decided to try pole dance. This kind of dance is gaining popularity nowadays, it combines plasticity, elegance, and acrobatics which makes it beautiful. This dance is quite complicated but with Pole Dance Lessons by Veena you can try to practice it without a teacher. 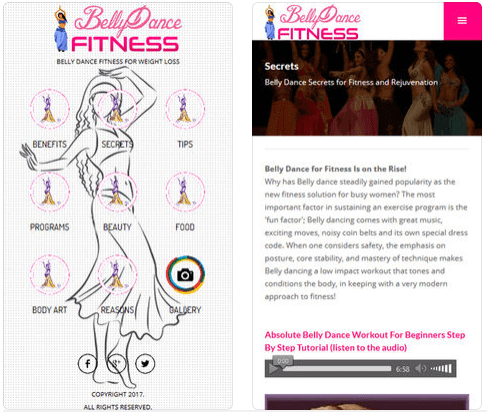 The app contains pole dance video lessons as well as lectures on body mechanics to make your training safe. Another pole dance app available for iPhone and iPad. The app contains lessons for different levels. There you can find not only video lessons on pole dance but also warm up and stretching exercises. The app is perfect for those who take classes for additional practice. For more pole dance apps, check our article: 7 Best Pole Dance apps for Android & iOS. This app is devoted to those who have decided to master in stepping. This type of dance is also quite complicated and requires efforts and constant practice. 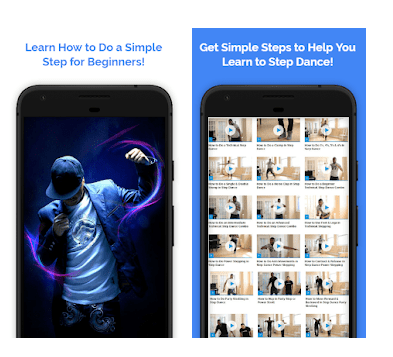 Step Dance Moves app contains stepping lessons for dancers of any level, beginner, intermediate, or advanced. The app is created is a base of video lessons and doesn’t have any extra functions. Hip-hop has proved to be one of the most popular kinds of dance. You can find many apps which would offer you different kinds of lessons. With Hip Hop Dance Trainer you can improve your hip-hop moves or catch new ones if you are a beginner. This is a video lessons library categorized for your convenience. New videos are added to the app quite often. Another hip-hop tutorial collection which can help you to master in this dance. The app is absolutely free, contains only high-quality videos. You can add videos you like to your favorite and categorized them. The app is very simple and light-weight. And one more app for those who want to get skills in hip-hop. 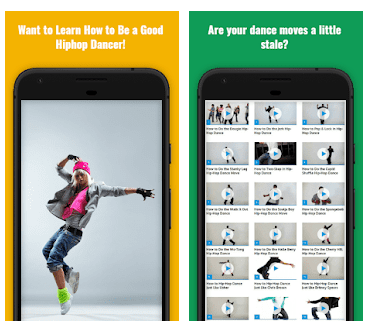 This app provides video lessons for dancers who already know something about hip-hop and want to improve their moves. You can find some tips for beginners there too. 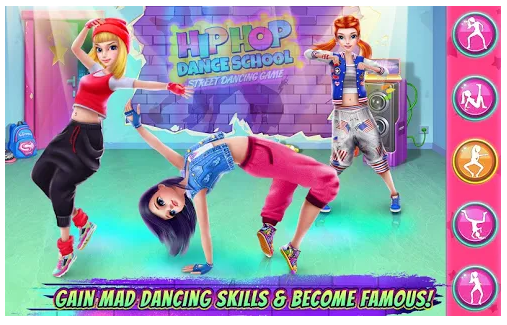 And, if you are tired of endless tutorials but still love hip-hop you can try this game. Create your characters, choose their outfit and make them train to give the best hip-hop performance for a big show. The game can inspire yourself for hard training. In this game. you can work out, follow the advice of your mentor, do everything to be the best. And, who knows, maybe you will catch some new moves for yourselves as well. Zumba is something that can cheer you up and help you stay in shape at any time. 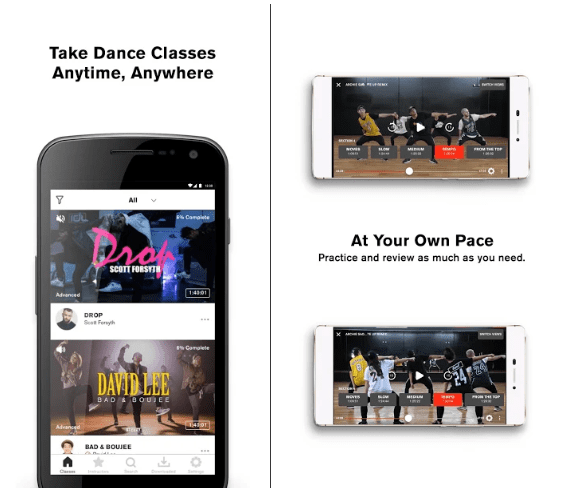 With this app, you will not have to find some classes, you can practice this wonderful dance anywhere using your device. The app works offline so you don’t need the Internet connection. Remember, it doesn’t matter what dancing skills you have — Zumba is for everyone! Another dance which is both beautiful and perfect for keeping feet is belly dance. 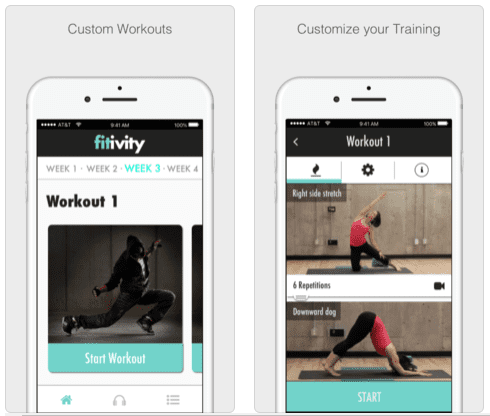 This app will give you everything for your regular training, from video lessons to health tips and secrets. What is more, the app will help you watch your diet to make your practice more useful. Many motivational pictures will help you keep practicing as well. 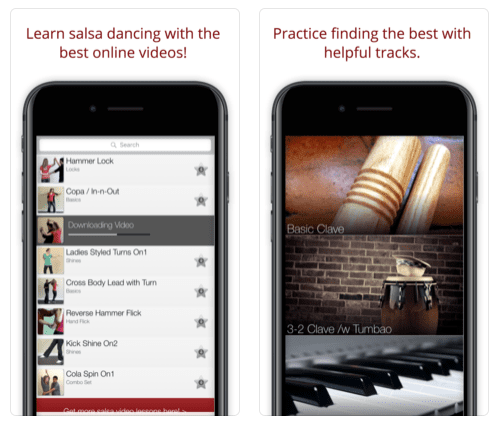 This app is for those who want to learn how to dance salsa. Pocket Salsa provides very good, easy and understandable video lessons for everybody. 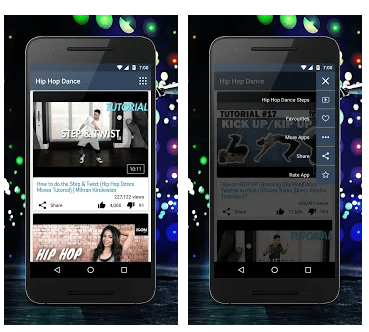 As for features, there you can find rated salsa video tutorials, what’s more, you can download any video to your device and watch it everywhere. In addition, using this app you can create your own melody for your special dance mixing different rhythms. The free version provides lessons for beginners, for more complicated tutorials you should buy the full version. Another cool and fun game for people who love dancing. Take a photo and become Santa who will show you some crazy moves. This app allows creating a cool personalized video and also to catch some new moves. Sometimes you need to use such apps to cheer up and enhance your self-confidence, which would motivate you to improve your dancing skills. 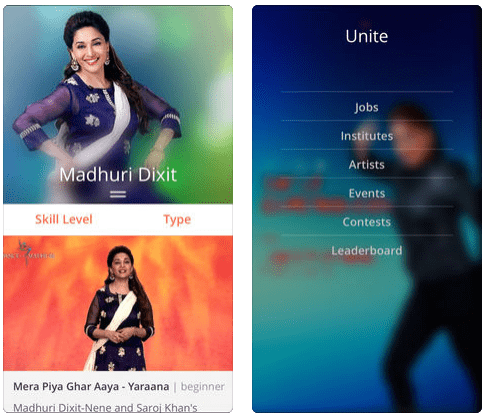 Madhuri Dixit, the star of Bollywood, wanted to teach the world how to dance, to synchronize every step, that’s why this app was created. Get united with people across the world through dancing and deepening into the Indian culture. This app provides a wonderful atmosphere for Indian dance learners. Want to know how to dance twerk? Check out this article. This is a perfect application for dancers who prefer to stay in shape. You will definitely love working out through dancing. It is not only useful for your health but also fun and motivating. The app contains different types of exercises. Their combination is perfect for any dancer’s training. The training is accompanied by tutorial videos and audio guidance. If you are a dancer, you need good stretching exercises. Check our article 17 Best stretching apps for runners and dancers (Android & iOS). One more cool dance game where you can find new moves and motivation for your practice and at the same time have fun. You should bring your character to the top by developing her dancing skills. You can choose what types of dances — from hip-hop to ballet — to dance and create your own dance school schedule. What’s more, you can choose an outfit and a boyfriend in this game. If you want to master at dancing you must make dancing your life. Then, why not to spend some time on romantic dance school story to motivate yourself? This is a good collection of dance tutorials for any dancer, beginner or advanced. 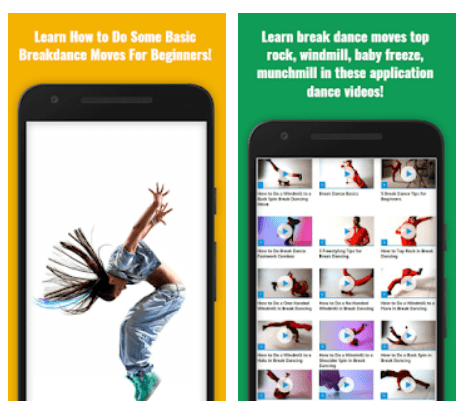 The app contains many videos with lessons of different dances: hip-hop, break dance, salsa, Indian dances and many more. The new videos are added regularly. Another great app for iOS to distract and love dancing even more. The idea is not new, but it is still fun. Put your or your friend’s face on the dancing character and enjoy crazy and funny moves. Another free library of tutorials for many different forms of dances. This app is created for beginners who want to try different styles and choose the best one for themselves. It includes modern dances (hip-hop, street dance etc. ), traditional dances, dances for losing weight and many others. Tutorials can be downloaded to your device. 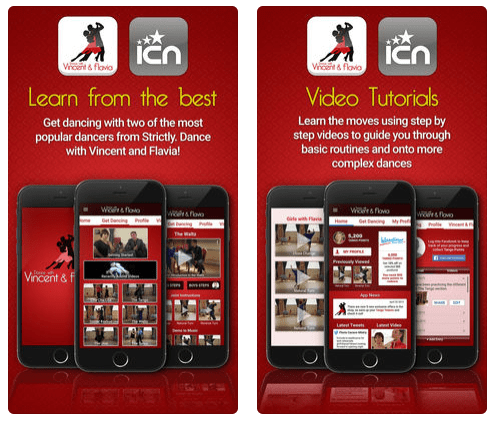 All the videos in the app are free, Dance Easy Steps Learning Tutorial doesn’t contain any in-app purchases. Dance with Vincent & Flavia contains video tutorials from famous dancers for everyone. The video lessons are understandable and easy to follow, so you can learn from the best for a very moderate price. The app is not free, a small price is charged on AppStore. 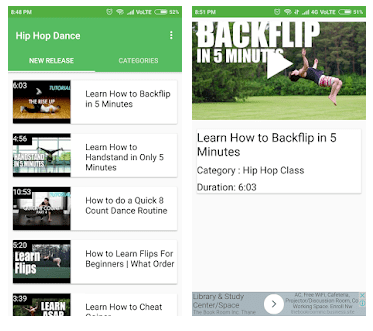 Breakdancing is one of the most popular forms of dance all over the world, and with this app, you can learn some cool moves. The app provides step-by-step tutorials, all the videos are arranged according to their difficulty. Even if you are not a beginner, you can watch everything from the easiest lessons to refresh your memory. Don’t miss your opportunity to learn how to dance the hottest dance in the world! Street dancing is a very spectacular combination of many styles, it is a naturally developed mix to express your feelings and emotions. Nevertheless, it is quite hard to perform. 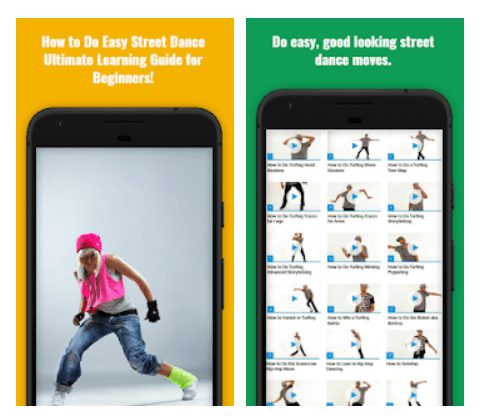 With this app, you will have your tutorial to develop street dancing skills from scratch. The app is good for dancers of all levels, what matters is your motivation and desire to become better. Bhangra is a high-energy folk dance originating from Punjab. This app teaches you all the basic moves from the very beginning. All the lessons are organized step by step so you can increase the pace gradually. 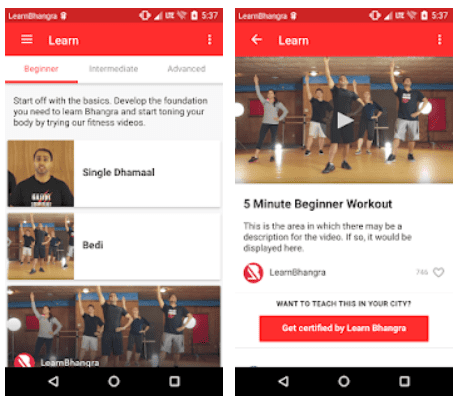 Starting learning Bhangra is a good way to try something new in your life, so the app is really one of a kind. Dance through your life, don’t make any excuses and always remember that practice makes perfect!